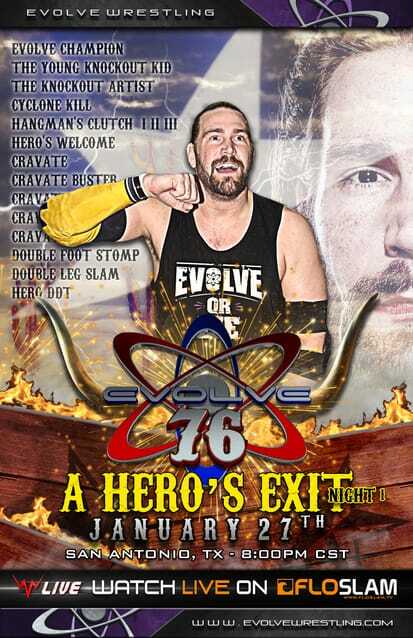 Since discovering Evolve thanks to the Cruiserweight Classic, I have been dying to go to an Evolve event. Thanks to the Royal Rumble, I was finally able to attend. The first thing that stood out to me was how approachable all the wrestlers were. 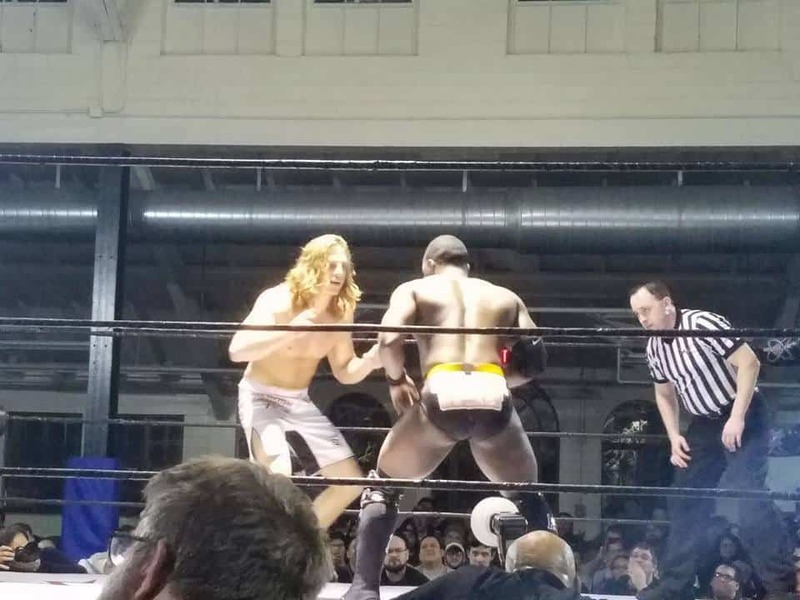 I had some good conversations with my favorite Evolve wrestler, Matt Riddle, and my favorite UK wrestler, Zack Sabre Jr. Second, I was shocked how small the venue was as I have never been to such a small wrestling event before. Finally, the fans were all really cool. It was nice being able to discuss indie and Japanese wrestling with other people. Before the matches started, Catchpoint came out to the ring. Their leader, Tracy Williams, stated they were the standard in Evolve, and they were going to prove tonight. This was the first time I have seen both of these guys perform. This was an unexpected bout because Jaka is a Catchpoint member, and this was more of a strikefest than a grappling match. I was surprised how skilled and nimble Peter Kaasa was in the ring. It was almost like I was watching Brian Cage in there. The match abruptly ended when Kasaa broke the middle rope while trying a springboard moonsault. Thankfully, he seemed alright after landing on his neck. Jaka hit a sitout powerbomb, and then Catchpoint came into the ring to make sure Kasaa was alright. Visually, this was a crazy matchup. Chris Dickinson’s arm is bigger than Darby Allen’s entire body. I thought this was going to be a squash match to make Dickinson look strong. However, this turned out to be anything but. I really like the story told during this match. You have Dickinson just tossing Allen around, and beating him to a pulp, but Allen never gave up. Matter of fact, he was countering the big man’s over aggressiveness. There was a really cool spot where Allen countered Dickinson’s Razor’s Edge off of the apron with a hurricanrana. In the end, Allen shocked us and Dickinson with a counter roll up victory. DUSTIN, formerly known as Chuck Taylor, does such a great job making us dislike him. Just something about him makes me want to see him get punched in the face. I have only seen Jason Kincaid once on Ring of Honor TV, but he’s such a fascinating character that it’s impossible to forget him. He is scrawny as hell, looks like a viking, and has some of the most unique move sets that I’ve ever seen. One of my favorite spots was when he rolled over the ropes, and caught DUSTIN with a stunner. It was crazy. Although DUSTIN had control over the majority of the match, he was submitted after he tried to use a chair. 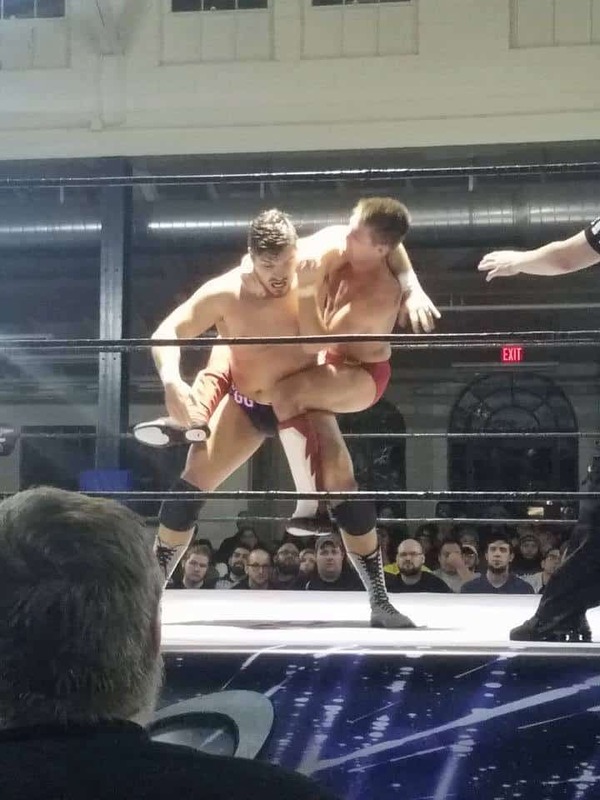 Match 4: Grudge Match: Ethan Page vs Zack Sabre Jr.
ZSJ had a fire lit under him. 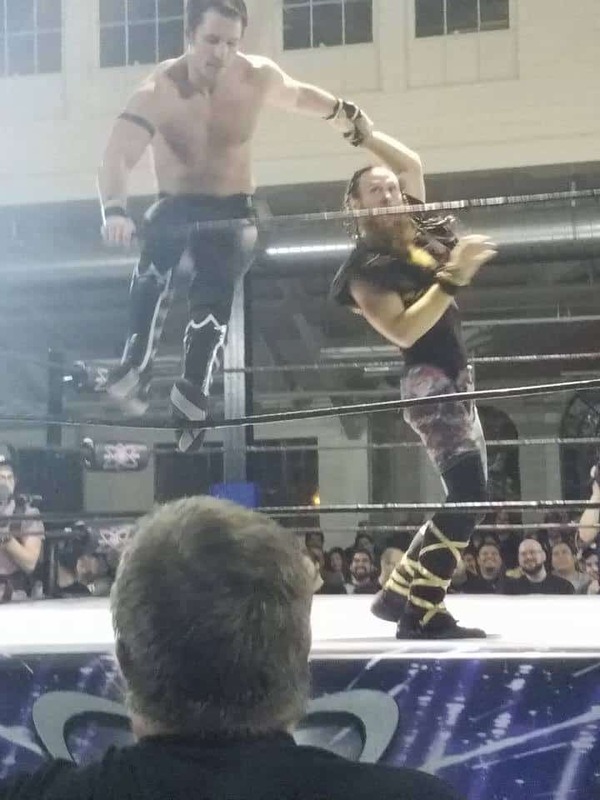 He came out and attacked Ethan Page and his goons (the Gatekeepers) during Page’s entrance. I was really worried that this match was going to be full of interference by the goons. Thankfully, Page told them to stay out of his match. If you have seen one ZSJ match, then you know what happened in this match. It was full of slaps, kicks, and a ton of submission holds. Page held his own though. 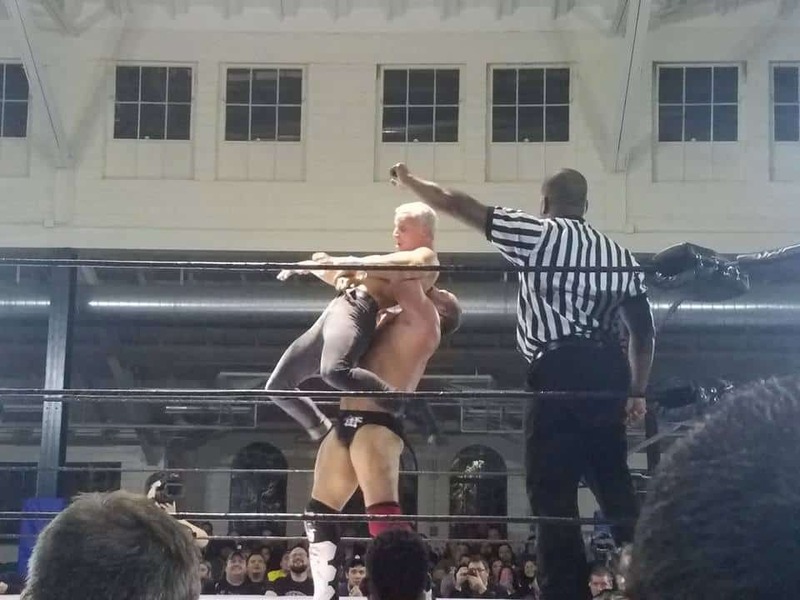 He used his sizable weight advantage and didn’t allow ZSJ to fully complete his holds. In the end, ZSJ technical skills proved too much for Page, and he tapped out to a triangle hold. After the bell, ZSJ refused to let go of the hold, and thus the referee overturned the victory. This was the match I came to see. I loved how much fun ACH and Matt Riddle looked like they having in the ring. It really translated well to their performance. For pretty much the whole match, they were countering each other slaps and kicks. They occasionally sprinkled suplexes and submissions in, but this was clearly a war to see who was tougher in the ring. At one point, I swear ACH injured himself cause he landed the most vicious soccer kick I have ever seen. It was the loudest hit I heard all night. Afterwards, ACH was limping. It was so hard that I was hurting. Riddle ended ACH with his version of the GTS, and landed his finisher to finally put him away. This was the technical classic I was expecting. For the first few minutes, Thatcher gets worked on by Catchpoint. That is until Matanza, oh excuse me Jeff Cobb, came in and started wrecking them. That was the tide his team needed, as they would control the better part of the match afterward. Thatcher would come in and stretch them out, while Cobb would come in and just toss them around. Near the end of the match, Williams finally got the help he needed when he tagged in Yehi. Shockingly, he made Thatcher tap out. This was the match we all came to see. 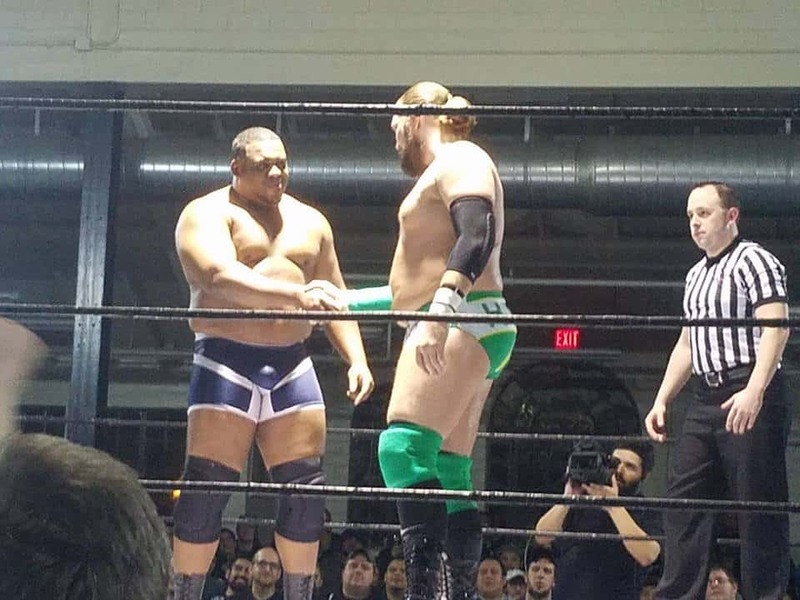 Not only was this Hero’s second to last match for the indys, but this was Keith Lee’s debut in Evolve. I have always seen Keith Lee paired up with Shane Taylor in ROH, but I never seen him perform solo. Near the start of the match, Chris Hero bounced off the ropes, causing the top rope to break on his head. This was pretty scary because it could have gone wrong in so many ways. The ref gave him a couple of minutes to gather himself because Hero was furious. Then, Keith Lee and Hero tore the rest of the top rope down, and dumped it on the outside while we all chanted “F that rope!”. This began a massive brawl between the two on the outside of the ring. If I didn’t know any better, I swear these guys were legit hitting each other. Then, in the middle of the match, Lee got on the second rope to jump off, and that rope broke! It was crazy! By that point, Hero and Lee just ignored the ropes, and started bashing each other in the middle of the ring. The owner of Evolve was behind us smashing stuff at the merch table, and pacing back and forth pissed beyond words. After a series of elbow strikes to the back of Lee’s head, Hero hit a sweet pile driver to end the match. Overall Thoughts: 7.5 out of 10 This was a great event. I really had no major issues with any of the matches. It’s refreshing going to a live event, and not having to sit through promo after promo like in other promotions. The storylines are short and to the point. People go to live events to watch wrestling, and that is what we got. I understand that Lee, Hero and Kasaa are big guys, but all of the rope breaks were ridiculous. Kassa nearly died, and the rest should count themselves lucky that nothing too serious occured. I went into the next day hoping that we wouldn’t see more of the same.